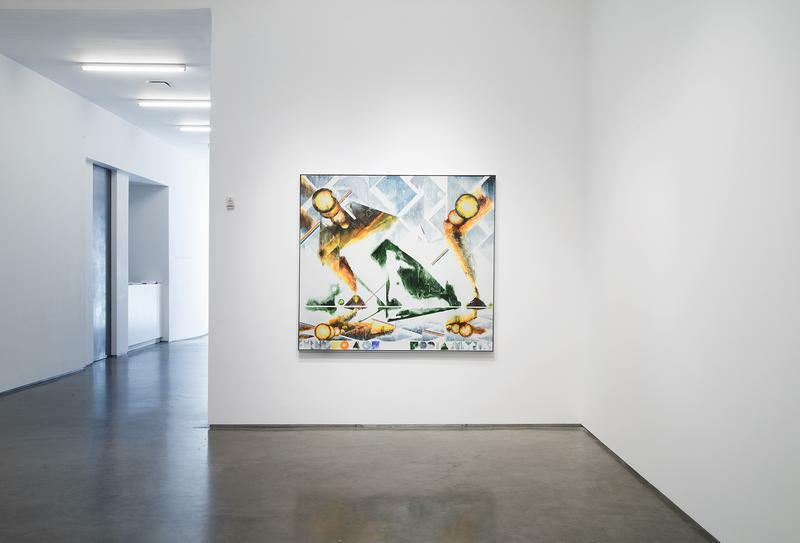 Marianne Boesky Gallery is pleased to present First Morning, Barnaby Furnas’ sixth solo exhibition since joining the gallery in 2002. 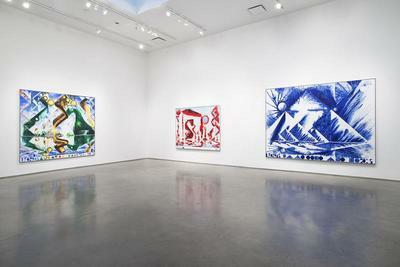 Furnas’ new paintings will be on view September 10 – October 10, 2015 at 509 West 24th Street. Since the 1990’s Barnaby Furnas has consistently painted sensory and epic material. He has illustrated battle scenes, suicides, rock concerts, Biblical stories, and monumental floods, all with the intent of capturing explosive energy and the passage of time on a two-dimensional canvas. With his new body of work, Furnas confronts a different, equally exciting subject, one he has looked forward to painting his entire career: the landscape. A suite of six paintings, these works are the artist’s contemporary rendering of what the first morning on Earth or the first American landscape might have looked like. Furnas draws influence from the landscape traditions of Paul Cézanne and Charles Burchfield, using both an abstract and figurative, controlled and uncontrolled technique. He works on each painting from the floor, a position that allows him the ability to manipulate pools of water and pigments on the canvas without the influence of gravity. Into his process he also introduces plastic geometric shapes. He carefully measures, cuts, and places the shapes onto the paintings with varying amounts of weight, combining his own hand and tools in surprising ways. 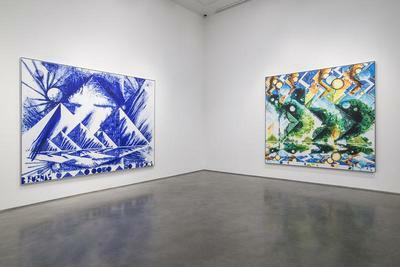 Patterned triangles and circles result on the canvas, and cohere into larger objects and environments. They reflect a painter’s interpretation of stained glass, in some areas forming illusions of representation, while in others, distinct mirroring and reflective effects. Another nuance of the work is the white band at the bottom containing a color bar, signature, and date. Although the making of the work has always been an emphasis for Furnas, an index of colors has never been present, and the artist’s name has never resided on the front of the painting. When asked about these features, Furnas references the white band at the bottom of a Polaroid, the area where details or memories can be written. He also draws a comparison between the history of photography and the history of painting in representing the grand landscape. Through which medium does the viewer feel more clarity? More energy? This has been Furnas’ question overtime, reinterpreting contemporary painting as a medium, and history or legend as a topic (even while many in the digital age denounce its immediacy and relevance). Nonetheless, Furnas’ paintings vibrate with untouched painterly technique and enthusiasm. They reassert the possibilities of modest materials, gesture, and figuration, all within the stasis and tradition of the landscape.